"Top marks for this release. Brumel has been well served." 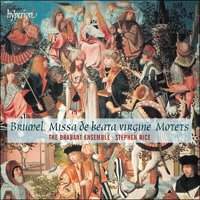 Any recording devoted to the music of Brumel is of course welcome. There are few currently available, and of the Missa de beata virgine, only one other: a lugubrious, thickly reverberant reading with the Speculum Ensemble (Naxos 8.570535). The release of a second recording, and by the likes of the Brabant Ensemble, provides some cause for rejoicing. If the composer’s polytextual Christmas motet Nato canunt omnia is one of his more popular compositions on disc, as much cannot be said for the album’s other works. In Beata es, Maria, Brumel uses his penchant for angular phrasing as an inspired contrast to the more regular phrases and rhythms of the original lauda. The clever, vigorous sequence Lauda Sion salvatorem is included in Stephen Rice’s reconstruction, based on what he believes (with some reason, as explained in the liner notes) is a corrupt published version in Petrucci’s Motetti B. Finally, the Ave caelorum domina exists in a Vatican manuscript where it begins Ave culus conceptio. Rice perceptively suggests Petrucci’s editor, Castellanus, changed the opening words because, as a Dominican, his order had yet to accept the doctrine of the Immaculate Conception at that time. I’m not sure I understand why the Petrucci printed publication’s far greater circulation makes it more deserving of performance, as Rice states, but it’s a minor point in any case. Rice also transposes down the Gloria and Credo of the Mass by a tone relative to the other movements to restore what he calls “parity of ranges,” given the shifting modality in the Mass (the Kyrie in Dorian, the Gloria in Mixolydian, the Credo in Hypophrygian, the Sanctus and Agnus Dei in Lydian). Whether it is necessary or not, the performance justifies itself. The Brabant Ensemble’s combination of precision, strong enunciation, and perfect clarity between parts makes them a fine choice for Brumel’s rhythmically propulsive works. In a review of their album of Mouton’s sacred music (Hyperion 67933; Fanfare 36:2), I expressed concern over the use of 17 singers in a relatively resonant environment that clouded the textures; not so, here. Twelve singers are employed, three to a part. Presumably that, together with a dryer acoustic, result in the crisp, cleaner sound of this release. It is especially important in the Gloria, where Brumel indulges his love for contrapuntal and rhythmic games, before destroying all notion of meter in an ecstatically repeated canon of an “Amen” that takes off like a dove ascendant at daybreak. Absolute transparency is a requirement throughout this Mass movement to appreciate the composer’s skill and wit. Rice and his Brabants manage it with a confident ease that does credit to their discipline, and hard work over the last 17 years. Top marks for this release. Brumel has been well served.